Mmm tom yum. I always get in these soup kicks. I’ll go through a phase where I’ll crave a certain type of soup and eat it all the time for a while, until a new soup catches my attention. 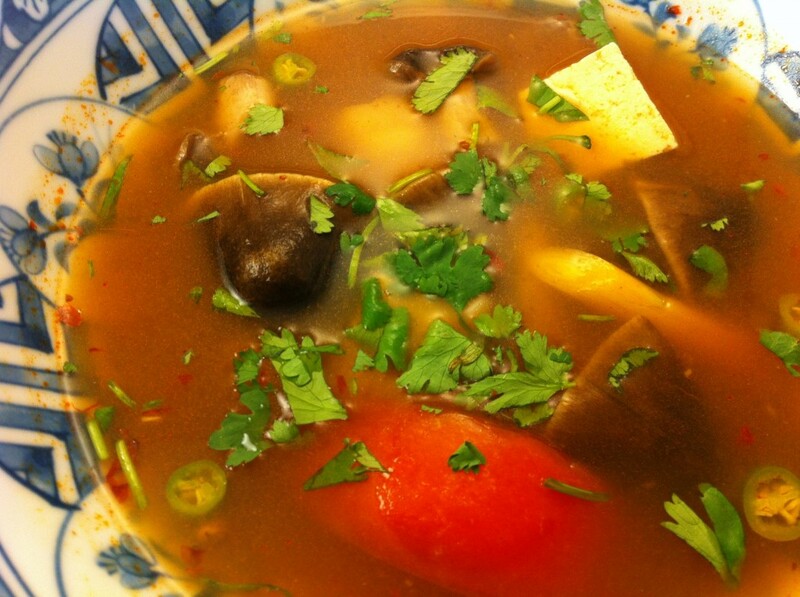 My current soup kick is Japanese ramen, but a few years ago it was all about tom yum. In this vegetarian tom yum, I used chili paste with fermented soy beans instead of fish sauce and nam prik pao (because it has shrimp in it) to give it some unami-ish taste. I didn’t have any homemade stock and used a Trader Joe’s brand that I decided I didn’t like. It was very iron tasting and even with all these flavorful ingredients, I could still taste a little bit of that broth in the background. I need to make some stock soon! You can get galangal, lemongrass, and lime leaves at Thai or big Asian markets (like 99 ranch). There really isn’t a substitute for any of these ingredients, but you can use dried galangal and lemongrass in a pinch. Some people say you can use ginger instead of galangal, but I don’t think they taste anything alike. Galangal is almost medicinal and mustard-like in a way. It is a very interesting ingredient! In a medium sauce pan cook the vegetable broth (preferably homemade stock!) with the chili paste, galangal, lemongrass, and lime leaves for a while to get all the flavors into the broth. Add the tamarind, maggi, salt, straw mushrooms, white mushrooms, tofu and tomato and cook until the tofu and tomato are heated through. Take off the heat and add the chilis and lime, and top with cilantro.